If you want to reach more people who care about your work by using social media, leverage the resources you have right in front of you: the guests, institutions and organizations that are featured in your segments. It is a benefit to everyone: the guest’s audiences are probably interested in their work, guests (usually) want to share that they were on a show or in a story, and you want to reach more people. To ensure this happens, keep social media information visible throughout the entire booking and follow-up processes. 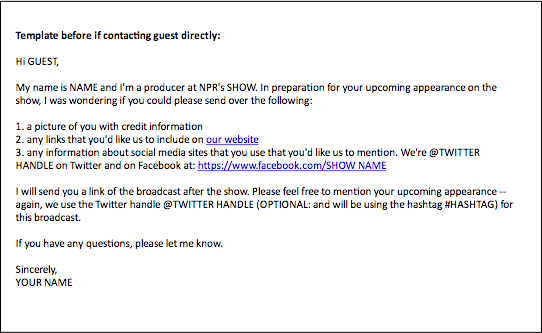 When sharing information about the show with your guest (or their publicist), include your show/station social media handles. Don’t rely on a Twitter handle in your email signature, though. Be clear and suggest sending a tweet or Facebook post about the work. Also, ask them for their social media accounts in the booking process. This will save you time and let them know that you may mention them as well. Make it as easy as possible for someone to share a story. Mention the guest’s Twitter handle or Facebook page in posts so that they can easily retweet it or share it on their own pages. Singer Cory Branan could easily see and retweet this message by Melissa Block since it included a Twitter handle for the singer. The author of ‘Orange is the New Black’ retweeted this link shared by The Brian Lehrer Show to her over 80,000 followers. Is your guest a professor? You could mention the university where they work. Or the company the guest works for, and so forth. If they have a press person, make sure to include them in the email you send with social media information in it. If you have a story you really want to bring more attention to — perhaps you’ve been working on it a long time — why not do a quick search and compile a few of the related accounts to include in tweets or Facebook mentions, or to include in emails? Of course, be careful to not be spammy — it’s a balance between being helpful and being annoying. Think Out Loud at OPB makes sure to always share social media information with guests, and use their guests (and their affiliated organizations) handles and hashtags while tweeting for the segment. 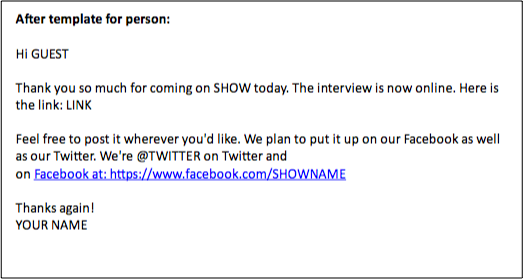 They also have “Follow Fridays” and send guests “thank you” tweets after being on the show. Your follow-up email with a link to the segment is another chance to make sure they have the right social information. 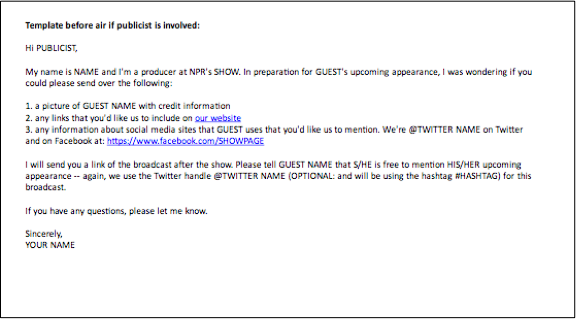 An example of an email letting a guest know where to find their appearance and relevant social media information. Courtesy Melody Kramer.